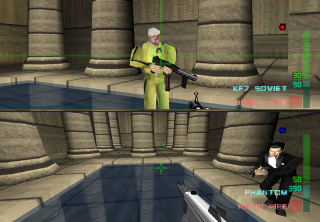 Emulation/Romhack/Homebrew Showcase: Goldeneye Being Ported To Perfect Dark Engine | The Gamesmen- What role will YOU play? This Romhack isn’t finished yet, but its one to keep an eye on. Wreck has released an early version of GoldenEye: X, an extensive project which will port GoldenEye 007 to Perfect Dark’s engine. This preview version is very early and has a lot of visual oddities, but gives a feel for what the port will be like. Eventually everything from GoldenEye, including the single player missions, will be ported to the enhanced engine. While there are no plans for any major upgrades visually, the engine has a number of improvements which will enhance the way the game plays. Many infamous limitations of the original guard AI, for example, will be a thing of the past. Multiplayer, which this preview showcases, will also benefit from the new engine–many new game modes, and much more customization than was possible in the original game is available.